Let me answer your question, good sir! Who exactly IS H.P. 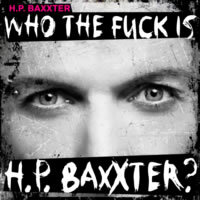 Baxxter, you ask? He's the MC of the popular German hard danc group Scooter. Now that we've solved that pressing problem, I guess there's nothing left but to look at this very weird release. At the time of this release, H.P. Baxxter was also moonlighting as a judge on the German edition of "The X-Factor", so his popularity was fairly high at the time. I believe, however, that H.P. Baxxter is present on this release in name only and that another background fellow at Kontor Records actually produced this track. His voice is nowhere to be found, and this really isn't the sound he's known for. In fact, no one should be known for this sound. First off is the Original Mix, which doubles as a radio cut, considering it's just over three minutes long. It starts out with— oh... oh, dear goodness no... a loud freaking obnoxious buzzing noise as an instrument. There has to be some mistake. How could anyone have considered this to be catchy, danceable, listenable, or acceptable? It is very grating on the ears and practically ruins a song that possibly had a chance. I imagine the producer was going for a strong tech-electro sound, but don't give me tinnitus in the process! The rest of the song is uninteresting, consisting of some techy beats here and there, but nothing majorly melodic that would catch anyone's ear. It's a DJ-set filler between actually enticing music more than anything else, possibly designed to keep you awake more than anything else. There's also an Extended Mix, intended only for brave souls who could actually survive an onslaught of FIVE minutes of this. To be fair, it does have a nice build-up, even if the hook feels like an actual fish hook to the noggin. It's shameful that H.P. Baxxter would allow his name to be splattered all over this musical monstrosity. I still believe that this may have been merely a promotional ploy to get his name out there even more at a time when he was one of the faces of the German TV , perhaps luring in a few more fans and some quick cash for the record label. But a terrible track like this is the wrong way to go about it. Maybe people will be thinking twice about H.P. after hearing something nasty like this.